It's perfect for carrying around the most important things with you. (SPOT.ph) Devices are usually made with a specific purpose in mind, either to solve a dilemma or ease and improve a certain situation. A smartphone, for example, is there to connect you to your peers and colleagues, while a laptop is your portable work tool. Tablets are devices made to fit perfectly between a smartphone and a laptop. It gives you the convenience and mobility of a smartphone, while providing you with a more portable version of the laptop’s work suite. With these features, the tablet is perfect for carrying around the most important things with you—may it be your hobbies, your passions or your work. While a tablet is already useful all on its own, put it in the right working situation and it can further power the passions that you love the most. Certain jobs benefit a lot from using a tablet, so if you’re doing one of them, you should seriously consider getting this gadget for yourself. For viewing movies and clips, you need to see the details of every scene—that smirk on the villain’s face, the glow in the heroine’s eyes, the vistas in the background—in crystal clarity. A great screen with stunning detail truly enhances the overall viewing experience and all this is possible with the Galaxy Tab S2’s 9.7-inch large Super AMOLED Display. Whether you’re creating a prototype or trying out the newest game, aside from a large screen that will let you visualize and manipulate graphics with ease, you’ll need a device with a fast processor. With its Octacore Processor, the Galaxy Tab S2 makes designing games fun – even when you’re on the go!—since you don’t have to worry about your device slowing down as you work. Searching for art pieces requires a keen eye for detail combined with an appreciation of heritage and culture. Examining each facet that can mark the difference between treasure and junk becomes much easier with the Galaxy Tab S2 as it comes in both 8-inch and 9.7-inch screen sizes. When you’re on the move and need to check on different aspects of your business, you’ll always appreciate a device that allows you to be mobile when shooting off emails, browsing the web, or running numbers. This is where the Galaxy Tab S2 comes in—its multi-window functionality allows you to accomplish all these tasks wherever you go. Create art all you want with the Galaxy Tab A with S Pen which lets you draw as easily as you would on paper. With the S Pen, this tablet managed to marry technology and the arts, and your creativity will never have to be stifled again. It can function just like a fountain pen – with brilliant effects like calligraphy—for moments when inspiration strikes. Designing anything, whether it’s a landmark structure or a kitchen nook, is a breeze with the Galaxy Tab A with S Pen. It lets you do multiple tasks all at once with its multi-screen feature. So you can be designing plans with your S Pen while getting inspired as you view your favorite pegs at the same time. Capture those fleeting thoughts and random ideas by jotting them down using the Galaxy Tab A’s S Pen, which feels so much like a real pen. Edit files like a seasoned editor by marking texts, jotting down notes, scribbling quotes, and committing thoughts to posterity using tools that will allow you to organize everything. You can even send those notes to your boss while you’re at it – the Galaxy Tab A with S Pen is LTE-ready, after all. Come up with fashion masterpieces or see how various fashion pieces come together using the S Pen. It lets you doodle and draw with ease, which is great when you're trying to illustrate your ideas. You'll also be able to clip images and photos of anything that inspires you and play around with designs. Not just that, the Galaxy Tab A with S Pen has an optimized viewing display that allows you to really critique your latest designs and enhance them even further. Let your events come alive with the expandable memory of the Galaxy Tab A with S Pen. You no longer have to worry about using up so much space on your device with your design concepts, floor plans, and other event details, making productions more efficient to do. 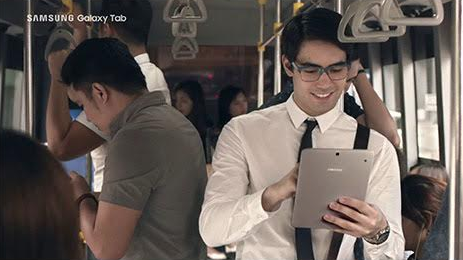 Whatever your passion is, you’ll find the perfect tab in Samsung. Choose between the Galaxy Tab S2 and Galaxy Tab A with S Pen to drive you to do what you love the most. Never fret about leaving the most important things behind because the Samsung Galaxy Tabs let you carry your world around with you. Check out www.samsung.com/ph for more information or go to a Samsung Experience Store nearest you.